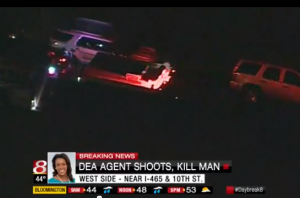 A DEA agent fatally shot a man at an Indianapolis apartment complex early Thursday morning, WISHTV.com reports. DEA agents were trying to serve a search warrant on the west-side apartment when the shooting happened. Posted: 10/17/13 at 8:52 AM under News Story.